The defense, the defense, the defense. The Michigan defense played lights out in a shutout victory over BYU this afternoon only allowing 105 yards to the Cougars on the day. BYU freshamn phenom Tanner Mangum only completed one pass in the first quarter, which went right out of the hands of cornerback Channing Stribling, and into Devon Blackmon's hands. Mangum finished the game 12-28 with 58 yards. The Wolverine defense held running back Adam Hine to only 33 yards rushing off of eight carries, one of his carries alone went for 29 yards. The Wolverines were able to shut BYU out, who came into this game average over 30 points per game through the first three games of the season. It was the first time the Cougars have been shut out since the 2003 season. "The thing I'm still irked about is that we wanted the 100-yard mark at the end," senior linebacker Desmond Morgan said after the game. "The shutout is definitely a big stepping stone for us, and something we should hang our hats on for sure." Michigan has only given up points in 10 of the last 12 quarters, and in the last three games combined have only given up 14 points. 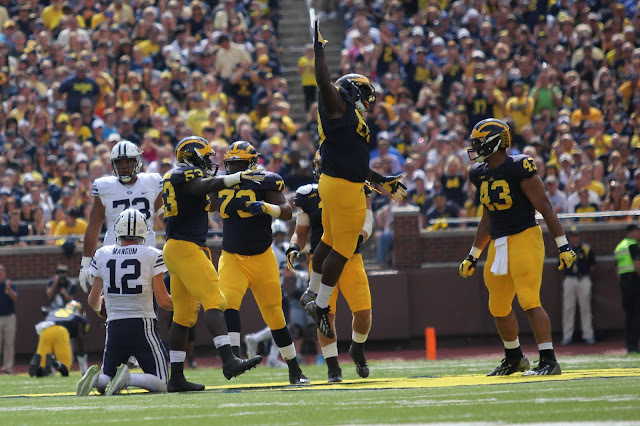 The Wolverine defense is now only allowing 9.5 points per game this season through the first four games. The Wolverines were able to open up scoring on their second drive of the game, but it would not have been possible if it weren't for Amara Darboh channeling his inner Odell Beckham Jr. making a one handed catch down the sideline on a third down and five play. It's been quite a week for Darboh, becoming a U.S. citizen on Thursday, to making incredible sideline catches, as well as touchdown catches on Saturday. He led the Wolverine receivers with four catches for 57 yards and a touchdown. "The team had some hamburgers for him on Thursday," head coach Jim Harbaugh said. "There was some USA chants in the locker room for him too." Darboh was not the only standout on offense this week however, as Jake Rudock came out and showed his ability to use his legs as well as his arm. Rudock opened up the scoring for the Wolverines on the second drive of the game and ran one in from three yards. He would finish 14-25 for 194 yards, and one touchdown, as well as 33 rushing yards and two rushing touchdowns. DeVeon Smith once again continued to build on what is already a stellar season. He ran for 125 yards and one touchdown, a 60-yard score that even he did not think we would score on. "To be honest I thought I was down for a second," Smith said. "Once I got to the second level, I knew for a fact I was not letting number 15 tackle me." Smith would eventually leave the game with an ankle injury, to which he said was not a big deal after the game. He came into the post game press conference wearing a walking boot which he called "precautionary." Smith expects himself to play next week, as does Harbaugh. Harbaugh credited the offensive success today to his entire staff, stating a lot of the play calls were wrinkles by Jedd Fisch. The play calling was most certainly different than we have seen the first few games, and we definitely saw a different Jake Rudock today. He took a few more chances, but did not force passes, he also was able to use hig legs to avoid negative plays, which was excellent to see. "Obviously you want to cut down turnovers, just being smart with the ball, having your feet as another check down opportunity," Rudock said. "The way they were rushing, and our line handled it there were creases I was able to run through." After the game BYU head coach Bronco Mendenhall said that Michigan is the best team that they have faced all season, and that their season starts over today. The Cougars have faced Nebraska, Boise State, and #9 UCLA. That means something big for the Wolverines, and now entering conference play they must take that momentum into the next game. The Wolverines travel to Maryland next Saturday, a night game against the Terps.